The strange weather in NYC continues this summer with the news that lightning strikes tonight when a plane lands at JFK Airport carrying two very special passengers. 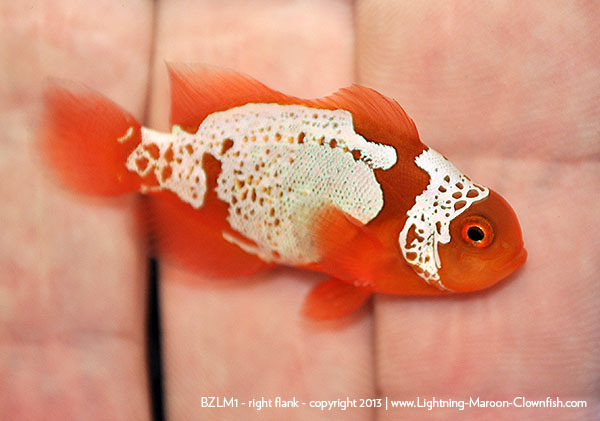 Known throughout the hobby as the Lightning Maroon Clownfish (P. biaculeatus “PNG White Stripe” F0 (male) X P. biaculeatus “PNG Lightning” F0 (female)), these two fish are the result of a very long and tireless effort by both Blue Zoo Aquatics and master breeder Matt Pedersen. Details on how these fish came to be have been documented for YEARS at the blog The Lightning Project, and despite many false starts and stops, the rare wild PNG collected fish finally chose a mate. Fast forward several months and these fish were offered for sale via auction by Blue Zoo (the original importer who selected Pedersen to pursue this project). Our sources tell us that BOTH of the first two fish were sold to the same buyer who paid over $16,000 for the pair, and promptly flew them first class to the center of the world, New York City. The parent fish have yet to produce additional offspring, so with only 14 of these fish in captivity worldwide, future buyers will have to be aggressive with their bidding in order to pick up two fish to potentially make a pair of Lightning x Lightning. Pedersen has said many times before that he believes the genetics of this particular pairing may produce some incredible possibilities. The buyer plans to keep the fish in their 120 gallon tank as the centerpiece of their show tank. The buyer was not specifically interested in breeding them, but if they do decide to mate the eggs will be transferred to the Long Island Aquarium and raised by Todd Gardner and Joe Yaiullo. We’ll have photos of the fish in their new home soon!